With Disney’s D23 Expo scheduled back to back with San Diego Comic Con this year, the month of July has turned into a non-stop parade of big pop culture news. 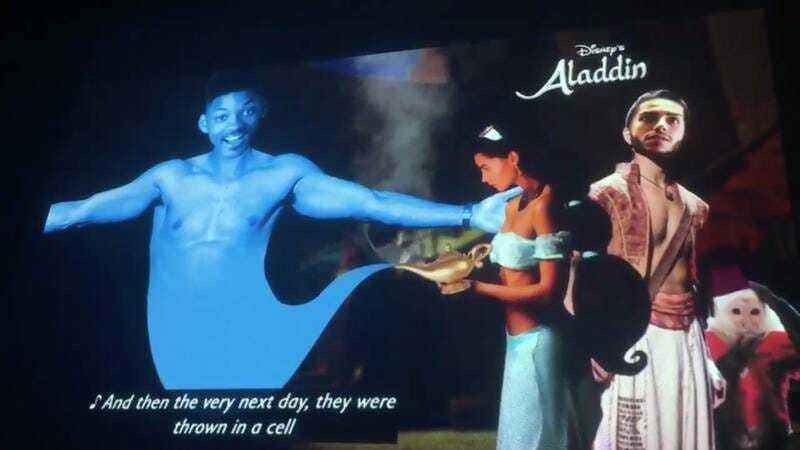 But one huge scoop that everybody seems to be sleeping on is the fact that, soon after it was announced he’d be playing the Genie in the upcoming live-action adaptation of Aladdin, Will Smith premiered a very real closing credits rap that details the film’s entire plot and is definitely not a joke. “The Genie Rap” is a return to form for the Fresh Prince, who peppers the track with dozens of his signature “Whoo”s and even gives a shout out to Disney composer Alan Mencken. Luckily, this exclusive musical sneak peek was captured by TV writer and Gilmore Guys co-host Demi Adejuyigbe, who just so happens to be the same guy who uploaded Smith’s previous ending credits raps for Arrival, Hacksaw Ridge, and Moonlight, which are compiled on the EP Will Smith Raps The Oscars. Unfortunately, the clip cuts off just as Smith prepares to, as he puts it, “summarize the other two-thirds of the movie,” so we’ll have to wait until the film’s release to hear the remaining verses. As for this clip’s authenticity, which clearly only a fool would question, Adejuyigbe is willing to verify it with a simple transaction.